Greetings to our friends of the Friends of HEAL Foundation! I recently had the pleasure of watching a 13 year old appear on her school’s stage at assembly, and perform for the school with strength and confidence. This young African orphan had originally arrived at that school in a very worrying state, unable to look people in the eye, close to mute in her lack of interaction, apparently unable to learn, and suffering from pica, a psychological disorder characterized by an appetite for non-nutritive substances. She was referred to HEAL almost immediately on arrival, and it became clear that she had suffered a very difficult life journey in her twelve years. Therapy commenced, and during her time in the program, her strengths came to the fore. She responded well to art therapy, in which she loved to use colour with drawing, and to tell stories using the sand box and play figures. In music therapy she displayed a love for music and rhythm, and discovered skill with dance and choreography. In creative movement she learned to appreciate her body, enjoyed yoga, and became a capable acrobat. In therapy sessions she showed that she was a quick learner, brave, and creative. These attributes helped her move through her grief, fear and loss, and settle into learning about the possibilities of her new life. Her well-being improved, and the pica disorder ceased. She found her voice, spoke up, and learned to look people in the eye. She began to trust people and form friendships. She began to learn well. She will no doubt be a school leader one day, and perhaps later a community leader. She will definitely be making a useful contribution to society. This is the work of FHEAL. The therapists in the HEAL services in our five schools are working hard and achieving great results with similar young people they serve. 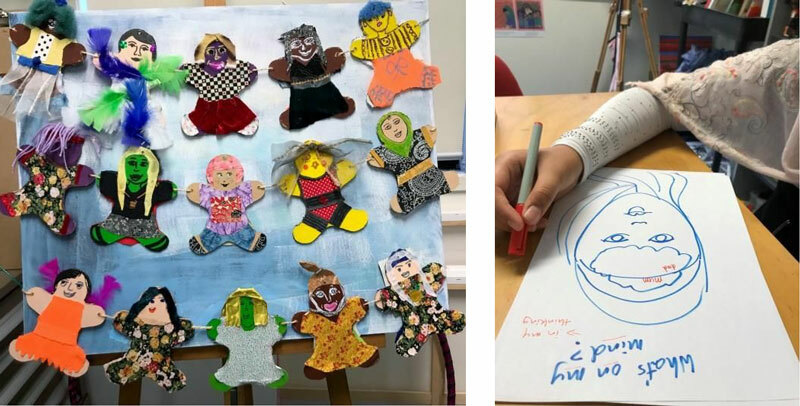 At Woodridge State High School two therapists are kept busy with children who need help with settlement and processing trauma, with the majority from Afghanistan and Africa. As well, one day per week, funded by the English Family Foundation, is dedicated to achieving a creative movement program, which assists children in using yoga, mindfulness, breathing and dance to help them move through the pain of past challenges, and into healthy futures. At Milpera, too, the children come from all corners of the globe, and therapists offer a variety of modalities to assist recovery. One of the days per week there, also funded by the English Foundation, allows for the inclusion of anti-gravity yoga, offered by specialist therapist Renae Stevens. At Yeronga and Kedron State High Schools we also provide service to a number of children from places such as Syria, Africa, Afghanistan, Iran, Burma and Thailand. The Commonwealth Bank is funding a photo-therapy project at Yeronga, one day per week, part of a three year, 3 school project. 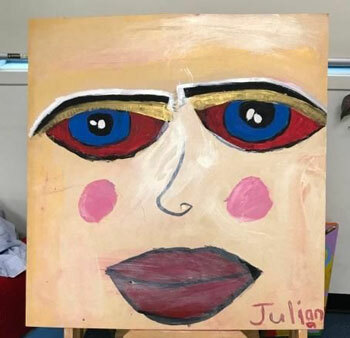 At St James College, the once a week art therapist assists students mainly from Africa, Iran and Afghanistan, and working on settling anxiety is a common focus for children who have had much to worry about. If you are interested, we are hoping supporters can vote for us once a week at https://mygivingcircle.org/ It costs nothing, and might lead to a cash price for you, and a grant for us! We have been pleasantly surprised by some surprise donations coming from friends, thanks. Some resulted from handmade pens made and sold for us; others from handpainted cards created and sold for us. However you help, thank you for your help with funding this important work. You are assisting us in aiding the recovery of children who have seen too much, lost too much, and are facing a difficult task in starting life over in this new place. With your help, we are succeeding in helping them heal, and building a better future. Jane Griffin (on behalf of Adele Rice, Chair, and the Board of FHEAL).